I had been looking at the Alfa Romeo Guilia since I first saw the advertisements about a year ago. I had a lot of time on my recent deployment to do research and read reviews of the vehicle. When I cam home, it was just a matter of test driving the vehicle and I was sold! The vehicle is fantastic and has lived up to my expectations in every way. I have had long commutes in the San Diego area and have dreaded the drives. Now, I look forward to getting in my new car and going pretty much anywhere. The car buying experience was by far the easiest I have experienced. It was smooth and quick. Ryan Satterfield was very knowledgeable and responsive to my wife's and my questions. He got the purchase process started and got the car ready for us in no time. The dealership is excellent! It has a small staff which makes it feel more personable. I have recommended this car and dealership to many people. I look forward to working with them in the future. Had an awesome overall experience from Virgil White on the sales side and Hector Yorba on the finance side. They were both very professional and helped me get a great deal on a Guilia Ti lease. Could not be happier about my new car! Thank you Ryan and Hector for making my experience purchasing my stelvio at Alfa the best. 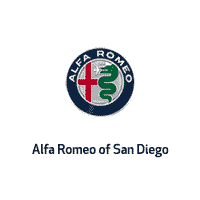 Alfa Romeo of San Diego in San Diego, CA caters to the needs of each individual customer with premium customer service. We know that you have high expectations and we enjoy the challenge of meeting and exceeding those standards each and every time. Allow us to demonstrate our commitment to excellence! Our experienced and factory-certified staff is eager to share its knowledge and enthusiasm with you. We encourage you to learn more about our dealership, schedule a test drive and investigate financing options. You can also request more information about a vehicle using our online form or by calling 844-468-5552844-706-9475. If you’d like to see a vehicle in person, click on Directions for step-by-step driving instructions to our dealership, or give us a call. We look forward to serving you!